Oxford don and theologian McGrath (Evangelicalism and the Future of Christianity, 1995) celebrates the King James Bible. The English translation commissioned by James I and completed in 1611 is distinguished in two ways, according to McGrath. It’s important to historians and theologians because it put Scripture into the hands of ordinary people. It holds an equally key position in the literary canon as one of the most poetic, haunting works in the English language. The first three chapters summarize the history of the Reformation, the invention and dissemination of the printing press, the status of the European middle class, and the consolidation of the English language. This may be necessary background, but McGrath’s rehashes of well-known information about Gutenberg and Luther are stale and plodding. He serves up fresher material in chapter four, a discussion of the first English Bibles. Introducing readers to the Tyndale Bible, an English version that preceded the King James, McGrath notes reformer William Tyndale’s commitment to rendering the Scriptures in “proper English.” Tyndale’s clear, accessible translation would “prove to be of foundational importance to the shaping of later English translations.” We also read about the Calvinist Geneva Bible before finally getting to the King James Version. McGrath is at his most fascinating when explaining that the King’s translation team did not begin “with blank sheets of paper in front of them”; they were aware (and respectful) of the long line of English translators in which they stood. Bibliophiles will relish the discussion of printing errors in the early editions of the King James, and its defenders will be pleased to learn that none other than Noah Webster praised it for “forming and preserving” America’s English. The book also contains many lovely illustrations and the occasional helpful chart, like “A Note on Paper Sizes,” which explains the differences between a folio and a duodecimo edition. 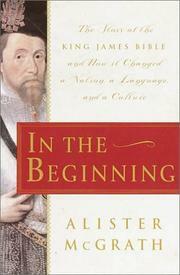 Neither as theologically profound nor as literary as the King James itself, but a useful and entertaining study.